I recently bought the new Viactiv® calcium chocolate chews to supplement my calcium intake and I was pleasantly surprised that not only they taste like a real chocolate but they are fortified with vitamin D. Vitamin D helps promote the absorption of calcium, so if you have a deficiency of vitamin D your bones may not be able to absorb the adequate amount of calcium they need to them keep them healthy. I have been diagnosed with a severe deficiency of vitamin D and I need to take supplements for the rest of my life (true story). I always worry my daughter could experience the same problem so I bought the Viactiv® calcium caramel chews to supplement her nutrition. She is very picky when it comes to supplements so I wasn't sure if she would like it or not. But guess what? She loves them. Her first reaction was "I feel like I'm cheating. This feels like I'm eating a real caramel. Yum!" Do something healthy and delicious for yourself and your daughter everyday. Try the individually wrapped chews in luscious Milk Chocolate, tasty Caramel or Sugar Free Chocolate! It takes a lifetime of smart nutrition and exercise to keep your body moving well through life. Start a healthy regimen today, and use these smart tips to help put you on the path to stronger bones— and a stronger you. The US Surgeon General and the National Osteoporosis Foundation recommend regular exercise to help build stronger, healthier bones. There's is a giveaway on the Viactiv Facebook page celebrating the brand's 15th birthday, with 15 monthly winners announced on the 15th of each month! Viactiv will also be sharing bone building tips, exercises and more from our registered dietician nutritionist, Heidi Diller, so we encourage everyone to like the Facebook page at www.facebook.com/Viactiv to enter and share! Viactiv Calcium Soft Chews are available in milk chocolate and caramel flavors and are available at Walmart, Target, Rite Aid, CVS, Walgreens, and drugstore.com. Disclosure: This is a product-provided, sponsored conversation that contains affiliate links. 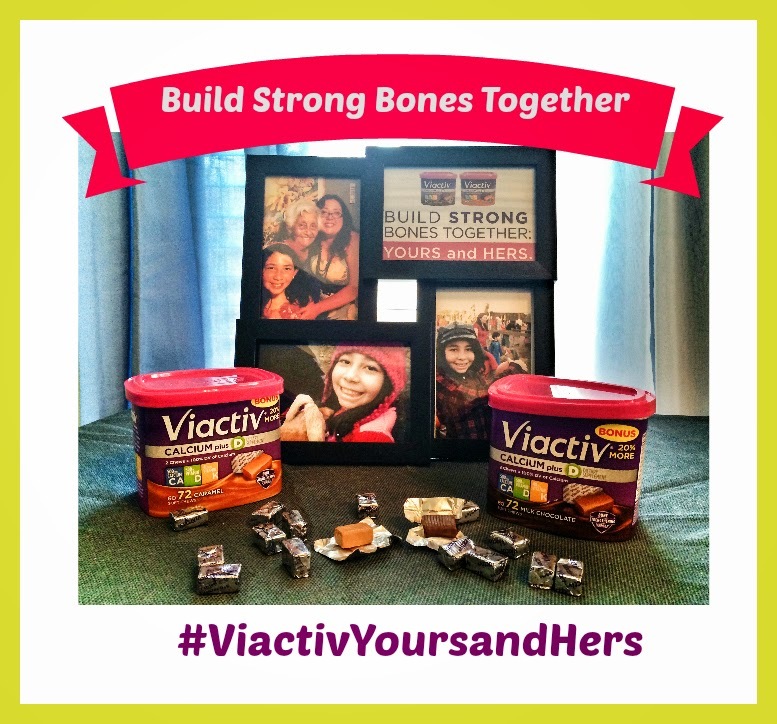 I received two full-sized canisters of Viactiv® Calcium Soft Chews and a picture frame for my own personal use. All opinions, text and experiences are my own.